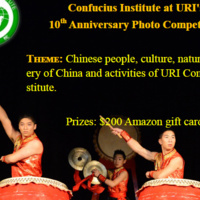 2017 is the 10th Anniversary of the Confucius Institute at URI. To celebrate this milestone, the Institute is inviting all members of the URI community to a photo contest and exhibition. Participants may submit up to five photos that they belive best represent China and the Chinese culture. All participants will receive prizes, and the top thirty photographs will be automatically entered into the Photo Contest and Exhibition. The owners of the top three photographs will receive an Amazon card and have their photograph posted inside the Memorial Union. Please submit entries to confucius@etal.uri.edu by 5 PM, Friday, September 8, 2017. For more information about submission guidelines and the competition, please go to http://web.uri.edu/confucius/.